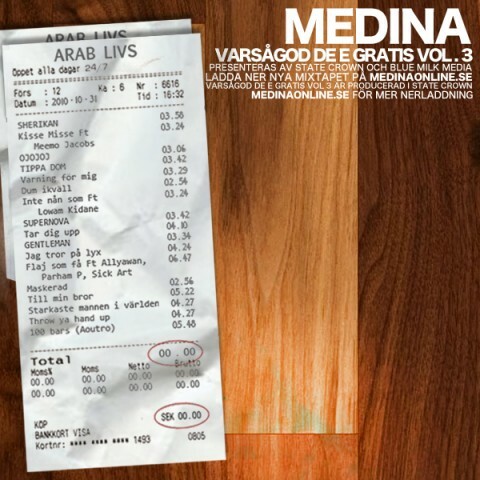 After thethe success with “Varsågod de e gratis vol.1″ and vol.2 Medina, which consists of rappers Alibi and Sam-E, is releasing a third installment in the mixtape series. This mixtape, just like the previous ones and as the name suggests, is released as a free download. The mixtape consists of 17-tracks that span between everything from house, rap and ragga. As usual Medina’s music is a mix between different genres but this time they have chosen to leave the oriental sound out. New for this installment is also that Medina has decided to work with other producers instead of producing everything themselves. “Varning för mig” is produced by Masse, “Dum ikväll” is produced by Howard Who and “Sherikan”, “Kisse Misse”, “Ojojoj”, “Inte nån som”, “Supernova”, “Ta dig upp” and “Maskerad” is Co-produced with K-One. Varsågod De e gratis vol 3 can be downloaded from here. This entry was posted in Nyheter and tagged Alibi, Howard Who, K-One, Masse, Medina, Sam-e, varsågod de e gratis vol 3 on November 2, 2010 by Daniel.